While there is no English equivalent for this Danish word, cozy is close and hug is related. Have you heard of hygge? Pronounced hoo-gah, it’s a Danish word that means “creating a warm atmosphere.” While there is no exact English equivalent, cozy is close and hug is related. What hygge is not, is drafty. Or noisy for that matter. Nothing will ruin this feeling of coziness faster than a poorly insulated house. Think of hygge as a collection of layers: the candlelight layer, the fuzzy blanket layer, the cup of tea layer. While you can achieve this feeling by adding more and more layers, it’s far easier to start with a solid well-insulated base. Not sure where to start? 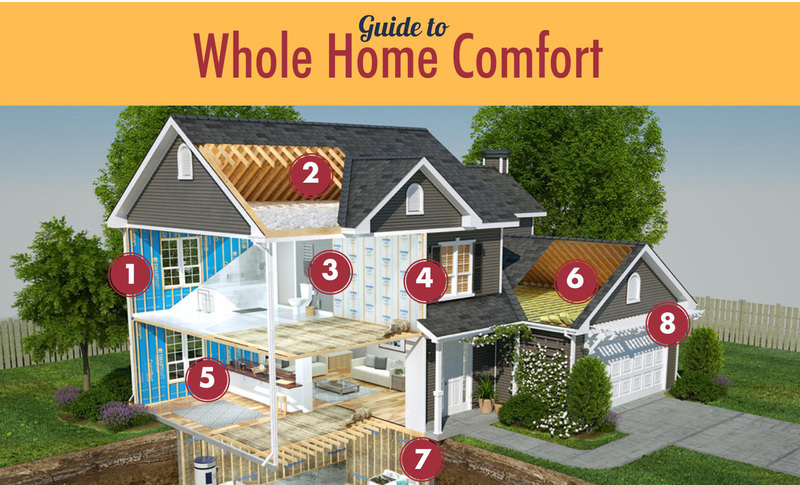 We’ve created you a guide to whole home comfort. All exterior walls in the house should be insulated. If you heat and cool your house, you’ll also likely need a vapor barrier. Try a smart product, like, SmartBatt from CertainTeed, which incorporates advanced technology for superior, long-term protection. Your house also needs protection from the elements; CertaWrap Weather Resistant Barrier provides an added layer of protection against air and moisture damage and CedarBoards Insulated Siding with innovative foam backing reduces exterior noise, enhancing interior acoustics plus integral foam increases your home’s energy efficiency providing an extra measure of comfort for your interior spaces. Adding attic insulation is the number one improvement you can make to enhance your home’s value – it can return more than 107% of its cost according to Remodeling Magazine’s latest Cost vs. Value Report. Make sure yours is properly filled to avoid wasting energy. Tip: If you already have batts and would like to increase your insulation levels, ask your contractor about adding blown-in insulation on top. Bathroom noises can be a real distraction. Adding insulation to the floors and pipes will dampen the sounds of rushing water throughout the house. Tip: Always use moisture managing products in high humidity areas like kitchens, baths and laundry rooms. Add insulation to the interior walls of a bedroom (and the ceiling if there are occupied rooms above) to help stop the transfer of noise between rooms and help guarantee everyone gets a good night’s sleep. Through normal activities – cooking, laundry, showering – the average family of four generates 2 to 3 gallons of water vapor per day. Make sure to use moisture managing products, like SmartBatt insulation, in these areas. Bonus: A well-insulated kitchen will not only keep the heat in and manage moisture; it will help keep the conversation flowing by blocking traffic and other outside noises. According to a Gallup poll, 43 percent of American employees reported working remotely at some time over the last year. If you are among them, adding a sustainable insulation to the walls and ceiling of the office can help block sounds and insulate you from the distractions of a busy household. If your garage is heated, it should be insulated. Use batts in the walls. Consider Easy Touch insulation for the unused space above to stop heat loss through the roof. In an unfinished basement insulate between the floor boards to properly seal off this area from the rest of the house. A finished basement should be treated like any other room in the house. Just make sure you have a good vapor barrier. Damp environments, like the basement are prime locations for mold. Tip: Insulate your water heater and ductwork to minimize their heat loss. Hygge has garnered a lot of attention over the last couple of years. It has spawned several books and was a finalist for word of the year in 2016 (after this year’s record breaking cold and general dreariness it could be a front runner in 2018 as well). And why not? Who doesn’t long for this feeling of soft warmth when the skies are gray and the temperatures low? For more ideas and solutions for getting your home hygge ready visit CertainTeed Building Insulation. Plus, that sweater may feel good but we explain why it’s really not doing much to keep you warm and planning tips for when the sun returns. Ready to get started on some comfort improvements for your home? Let us help.